No other major resort destination in the world caters to such a range of visitor interests - from luxurious and sophisticated tastes to budget and mass partying cravings. Acapulco has it all. 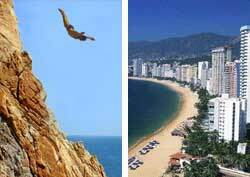 Acapulco is blessed with a beautiful bay lined with smooth sandy beaches edged by mountains. This is the primary reason I rank this destination above other mass-market Mexican beach resort areas such as Cancun. Acapulco has watersports galore, from parasailing to sportfishing. On land, you can enjoy outstanding golf and tennis facilities. Acapulco has a number of world-class resorts with gorgeous, relaxing seaside ambiances. Eating is a favorite pastime among the vacationers. Restaurants suit all yearnings and pocketbooks, from gourmet to fastfood. Many have outdoor tables. There is no shortage of clubs for the party-till-dawn youth. Acapulco is also ideal for families with children in tow. Very popular is the vast waterpark. Daring cliff divers at La Quebrada gracefully dive from a high perch on the cliff down into a small seaside cove flanked with jagged rocks (see photo).